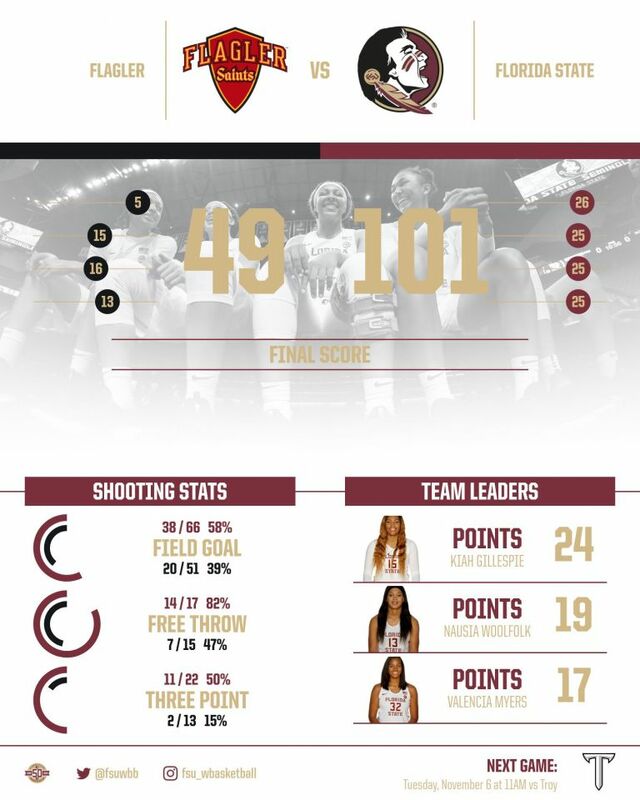 TALLAHASSEE, Fla. – Florida State’s trio of junior captains led the Seminoles to a 101-49 victory on Sunday over Flagler College in an exhibition game at the Donald L. Tucker Center. Redshirt junior forward Kiah Gillespie led the Seminoles with 24 points on 10-of-13 shooting. The Blue Ribbon Panel Newcomer Watch List member added five rebounds in her debut for the Garnet and Gold. “I definitely learned the traditions and the values from just how hard they went last year. Sitting out made me really want to come in this year and really just show that,” Gillespie said. Junior guard Nausia Woolfolk contributed 19 points on the afternoon and five rebounds of her own. Her fellow junior guard, Nicki Ekhomu, added 11 points and led Florida State with nine assists. The Seminoles’ three captains combined to score 36 of Florida State’s 51 first-half points. Freshman forward Valencia Myers led the newcomers with 17 points and five rebounds Sunday afternoon. Myers went 7-of-9 on the day and led the Seminoles with four steals. Redshirt freshman guard Sayawni Lassiter added 12 points on the afternoon, all of which came from 3-point range, shooting 4-of-6 from beyond the arc. Freshman guard Amaya Brown contributed eight points and was the fifth different Seminole to record five rebounds. The Seminoles shot 57.6 percent (38-of-66) from the floor, including 11-of-22 from 3-point range. From the free throw line, Florida State shot 82.4 percent (14-of-17), including 100 percent on nine attempts in the second half. Florida State begins its 2018-19 season at home on Tuesday, Nov. 6 at 11 a.m. against Troy. The game will serve as Field Trip Day at the Donald L. Tucker Center.